Here are 5 common reasons why your keyboard shortcuts might not be working (all described below). Watch the short video below for a walkthrough, or scroll below for more details. Most new computers now start with the media keys at the top of the keyboard as the dominant command. That is, if you hit the F1 through F12 keys, the media keys (mute, lower volume, increase volume, etc.) are triggered, rather than the standard F1-F12 commands. Note: If your media keys aren’t working, you have the opposite problem: your F1 through F12 keys have been set as the dominant commands. Whichever problem you are having with your media keys, adding in the FN key to your shortcut will solve it. For example, if F12 for Save As is not working in Word, Excel or PowerPoint, that probably means that your media keys are dominant. You can just hit FN + F12 and your save as keyboard shortcut will work. If you want to use your Media keys every once in a while but still use your shortcuts normally, you can simply lock your media keys. To lock your media keys, find the Function Lock (FnLock) command on your keyboard and activate it. On my keyboard, the Function Lock shortcut is FN + ESC. In this way, you can lock your Media keys, using the volume and mute commands when you are watching a movie on your computer, and then unlock it when you are using Excel, PowerPoint and Word, so you can use all of your F1 through F12 keyboard shortcuts normally. If you want your media keys to ALWAYS be in a specific way (you don’t want to flip back and forth between them) the final option is to restart your computer and in your System BIOS, choose how you want those function keys to behave. For help doing that, see this article on what to do if your Function keys aren't working. 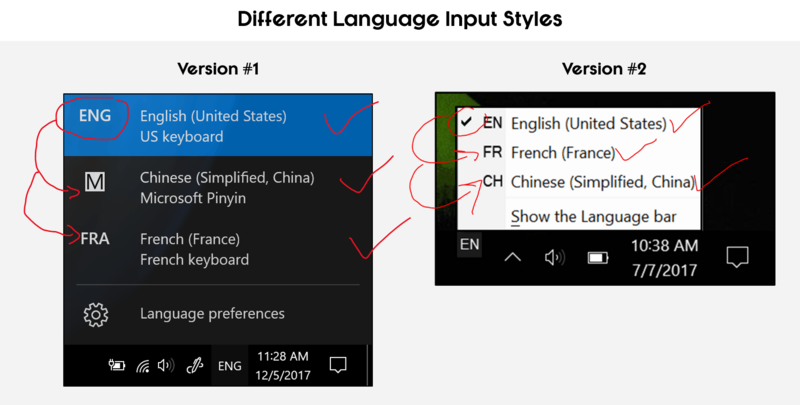 If you are using more than one language input on your computer (English, Chinese, French, etc.) your language bar might have overridden some of your favorite keyboard shortcuts. 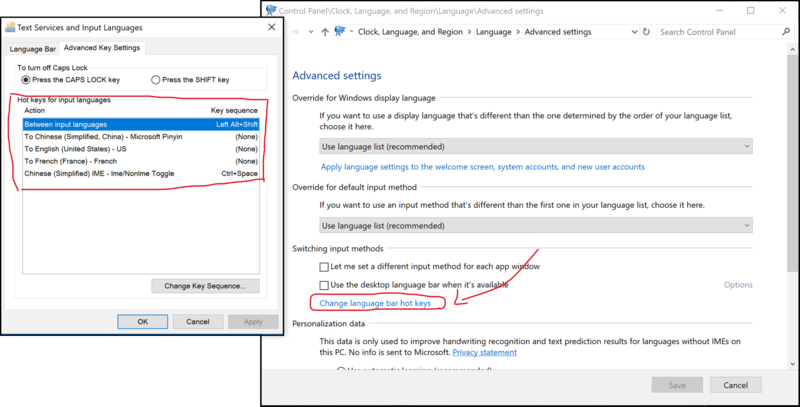 To adjust your language bar keyboard shortcuts, follow these steps, according to your version. For a video walkthrough of this, see the video at the top of the page at 1:52. Most keyboard shortcuts online are quoted using a standard U.S. keyboard. 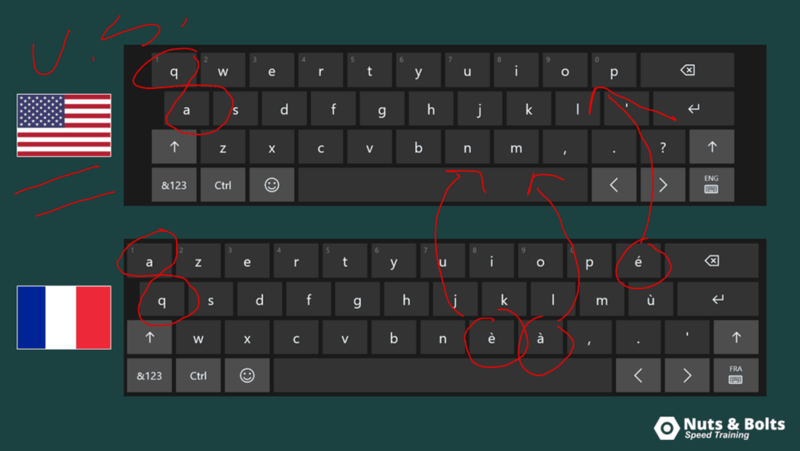 That means that if you are using a Dutch, French or other non-English keyboard, the key sequences to your different shortcuts might be slightly different. There is no catch-all description for what will and won’t work, so you’ll just have to look them up for your specific keyboard. In this, Google is your friend. Most keyboard shortcuts are quoted based on Windows keyboards. That means that if you are using a Mac or a Mac keyboard, your key sequences might be slightly different, and require a bit of extra research. In general, the CMD key on a Mac translates to the CTRL key on a Windows keyboard, allowing you to quickly learn Windows keyboard shortcuts. That said, there are other shortcuts that require extra keys like the Group shortcut. Having a Program Troll hijacking your shortcuts is another common way you might lose access to your favorite keyboard shortcuts, for no apparent reason. Program Trolls are simply other programs you install on your computer that have their own set of shortcuts that take over your existing keyboard shortcuts. This can happen immediately when the program is installed on your computer (like EverNote), or it can happen only when the program is open and running (like GoTo Webinar). 3 common Program Trolls I see are EverNote, GoToWebinar and Camtasia. Changing the shortcuts for each Program Troll should automatically turn on your old shortcut, but you can always restart your computer to make sure it takes. 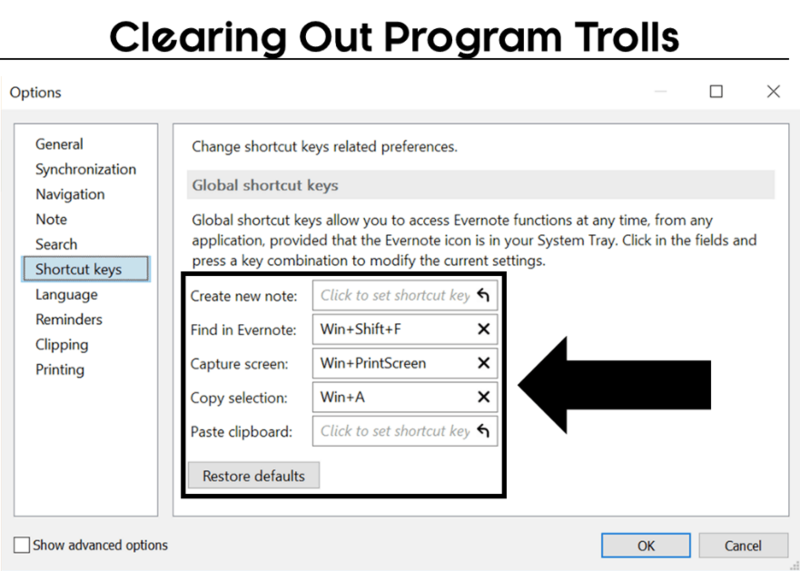 To see an example of me clearing out some overridden EverNote shortcuts, see 4:11 of the video tutorial at the top of the page.